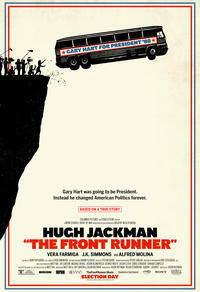 While a political film, THE FRONT RUNNER remains even-handed (...). Jason Reitman's drama revisits the moment when presidential hopeful Gary Hart's adultery became a national affair. The Front Runner is serious business - so serious that there's no place for breezier speculation about Hart's bad habits. But he's missing both key insight and satirical bite in his depiction of this pivotal point in American history. Hart's implosion over infidelity allegations in 1988, setting up the tabloidization of politics, makes for a snappy if thin dramatization.